Here are hundreds of designs for Christmas & Holiday gift wraps. We realize there are many holiday gift wraps to look through, as such, here are some hand-picked theme which we like whether it’s specifically for Christmas, a Holiday, or Special Occasion. 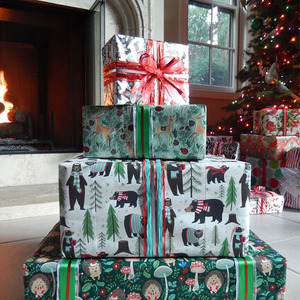 Here are 5 Christmas gift wraps designs which we liked. First is our gift wrap, from JR Holiday, covered with faces of Kris Cringle, Santa. This gift wrap stood out because it’s cute, each face has different expression, and he’s face is red as if he had couple drinks. Second Christmas Gift Wrap is our Sweater Print; the sweater that your grandma will knit for you onto gift wrap came out better than we expected. Lastly our Reindeers Hop, with white and transparent reindeer in different positions and faces. Don’t just take our word for it, these are just our recommendation. All of our holiday gift wraps are made of 100% post-consumer recycled fibers. That means our gift wraps are environmentally friendly. We have three different sizes to choose; 208 feet, 417 feet, and 803 feet. All of our gift wraps are sold in quarter reams. Lastly, give us a call. We always love to hear our customers, whether it’s a question or feedback.